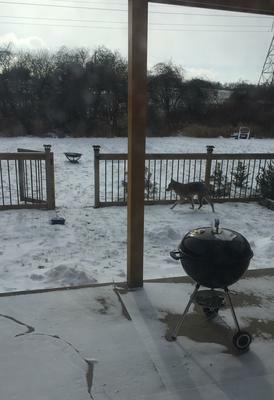 A Coyote sighting in my backyard on Monday January 18th at 2pm. I was playing inside with my two daughters when I saw the Coyote run in my backyard, look in the garden and run out. It surprised the crap out of me! Wow, that's what I'd call a Close Encounter of the Coyote kind! Join in and write your own page! It's easy to do. How? Simply click here to return to Coyotes .